Ultimate Ears launches Boom 3 and Megaboom 3 Bluetooth speakers | What Hi-Fi? The third-gen portable Bluetooth speakers have been redesigned, come in four new colours and have a new one-touch playlist feature. Ultimate Ears has taken the wraps off the Boom 3 and Megaboom 3 – the latest generations of the company's popular portable Bluetooth speakers with 360-degree sound. Hoping to build on the excellent outgoing range, Ultimate Ears claims an improved the design, ruggedness and durability with a sprinkling of new features to refine the user experience. Most notable is the new top button - called the "Magic Button" - which lets you play, pause, skip tracks and even summon playlists with a single tap. You'll need to download its bespoke app to set up your favourite playlists, but you can then skip through any song and even cycle through your added playlists without going near your phone. There is a caveat: you can only create playlists using Apple Music for iOS users, while Android users will have to use Deezer Premium. Ultimate Ears assures us that other music streaming services will be added in the future. We hope so. The heavy-duty fabric covering has been reworked for toughness, leaving the Boom 3 and Megaboom 3 pretty much impossible to damage. The new IP67 rating means the made-for-outdoors speakers are dustproof as well as waterproof and drop-proof, and the speakers also float, just like the smaller Wonderboom. Other design features include a repositioned USB charging port, a new hanging loop at the top and a white LED surrounding the redesigned top button. Battery life for the Boom 3 and Megaboom 3 clocks in at 15 hours and 20 hours respectively (same as the previous models), and they're fully compatible with the Power Up charging dock (£35). Elsewhere, the Bluetooth range for both speakers has increased to 45m (150 feet), and while the Boom 3's sound remains unchanged from the outgoing Boom 2, the twin passive radiators on the Megaboom 3 have been "enhanced" to deliver "deeper bass and improved clarity" over the original Megaboom. The new Boom 3 and Megaboom 3 are available in four two-toned finishes: Night (Black), Sunset (Red), Lagoon (Blue) and Ultraviolet (Purple). There are also two Apple-exclusive colours - Denim (dark blue) and Cloud (light blue) - out in mid-September, with more options on the way. 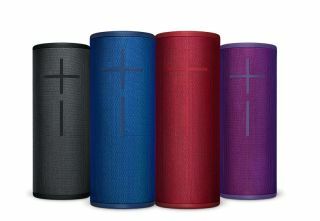 The speakers are aggressively priced, with the Boom 3 costing £130 and the Megaboom 3 £170. Both speakers go on sale on 3rd September as a John Lewis exclusive and will be available at all major UK retailers from 14th October onwards.